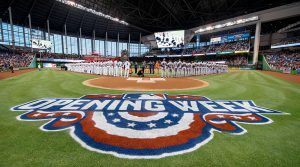 It is opening day, one of the best days of the year on the sports calendar. Here is our first DFS line up of the season. P: Carlos Rodon, White Sox at Royals ($7,500): Rodon was dominant in August and September last season. When his command is good, Rodon is as good as any left handed starter in baseball thanks to a fastball that he can bust inside on righties. He has a terrific match up against a weak Royals line up today. P: Masahiro Tanaka, Yankees vs. Orioles ($9,300): Tanaka is a risky DFS play most starts but an opening day match up against the rebuilding Orioles is perfect opportunity to make some money. C: J.T Realmuto, Phillies vs. Braves ($4,500): Realmuto is the best hitting catcher in baseball. I love this match up against Braves starter Julio Teheran. Teheran has a tendency to fall behind in the count against the bottom third of opposing line ups. When he does, he also tends to leave the ball over the plate. Realmuto has the ideal power stroke to take advantage at a park like Citizens Bank. 1B: Joey Votto, Reds vs. Pirates ($4,800): I cannot believe I am paying for Votto again considering how much he disappointed me in my standard leagues and DFS last season. I am not giving up on him however. I believe he will see more pitches this season and he will take advantage of having more protection in the line up. 2B: Roughned Odor, Rangers vs. Cubs ($4,000): Rougie at home against Jon Lester appeals to me. It is not quite warm enough for balls to fly out of Globe Life Park but Odor is still a good play because he is a left handed hitter who can hit the ball the other way could have a good day at the plate. 3B: Anthony Rendon, Nationals vs. Mets ($3,700): Rendon has a tough match up against Jacob DeGrom but if there is one hitter in the Nationals line up that can make DeGrom pay for a mistake, it is Rendon. The Nationals line up will hit even without Bryce Harper and Rendon will be a big reason for that. SS: Gleyber Torres, Yankees vs. Orioles ($4,400): Torres is looking to build off of a fantastic rookie season. A match-up against a power righty like Andrew Cashner who likes to leave the ball over the plate on occasion is ideal for a hitter like Torres who has great plate coverage. OF: Eloy Jimenez, White Sox at Royals ($4,300): The White Sox are putting a lot of faith in the free swinging Jimenez by paying him and putting him on the opening roster. Jimenez has the opportunity to get off to a good start this season against Royals starter Brad Keller who was surprisingly good last season but lacks a power out pitch. OF:Andrew McCutchen, Phillies vs. Braves ($3,900): I will not play Cutch often, trust me. I just like the Phillies line up today against Julio Teheran. OF: Hunter Renfroe, Padres vs. Giants ($3,600): I am rolling the dice here with Renfroe against Mad Bum. Renfroe strikes out a ton but Madison Bumgarner has struggled with his location at times this spring. If Renfroe gets a hold of one, he is one of the few bats in the Padres line up that can take advantage of it.